Staff and volunteers involved in stewardship, development, and fundraising play a vital role in cultivating generosity in donors and in helping them connect with Christian ministries that share their passion. 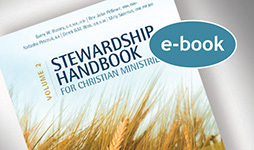 The Stewardship Handbook for Christian Ministries provides a holistic, biblical perspective on stewardship, a comprehensive foundation in Canadian charity law, and practical application. 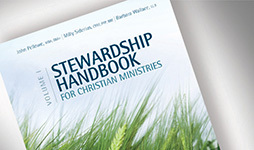 Whether you are a church considering a building fund campaign or a larger ministry with development staff, this handbook is an essential, accessible resource. When you purchase an e-book, you will receive a link in your email receipt to download your choice of e-book file. 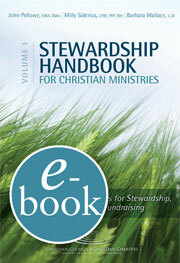 "The Advancing Stewardship course was one of the best courses I have ever taken. From the biblical foundations through to the practical applications, all of the material was designed to be put into use immediately. We have benefited from the information on capital campaigns, stewardship polices, legal matters, and an overall refreshing of our church and school’s approach to the ministry of stewardship." — Diana Koldyk, Chief Financial Officer, Grant Memorial Baptist Church.